31.1 (1 oz). The amazing Popigai meteorite is predestined to be immortalised on this very interesting 1 Oz Silver coin, the third of series “Meteorite”, with an authentic fragment of meteorite inlaid. 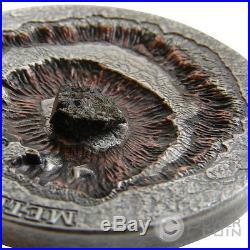 It depicts the famous Meteor Crater created by the meteorite impact about 35 million years ago in Siberia, Russia. The coin features Ultra High Relief, antique finish and mintage is limited to 666 pcs! The coin’s reverse features a real and genuine meteorite Popigai over the meteor crater in Russia. 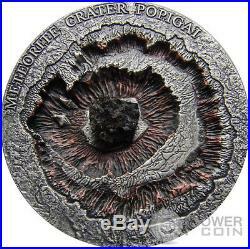 On the top of the coin the inscription “METEORITE CRATER POPIGAI”. The obverse of the coin depicts the effigy of Her Majesty Queen Elizabeth II. Below inscriptions: Ag 999 (hallmark). 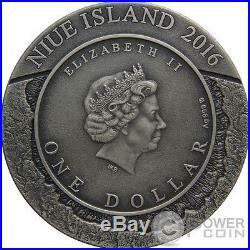 Along the rim inscriptions: ELIZABETH II, ONE DOLLAR (face value), NIUE ISLAND (issuer), 2016 (year of issue). Meteorite Popigai The Popigai crater (or astrobleme) in Siberia, Russia is tied with the Manicouagan Crater as the fourth largest verified impact crater on Earth. A large bolide impact created the 100 kilometres (62 mi) diameter crater approximately 35 million years ago during the late Eocene epoch (Priabonian stage). The crater is 300 km east from the outpost of Khatanga and 880 km (550 mi) NE of the city of Norilsk. It is designated by UNESCO as a Geopark, a site of special geological heritage. There is a small possibility that Popigai impact crater formed simultaneous with the approximately 35-million-year-old Chesapeake Bay and Toms Canyon impact craters. For decades the Popigai crater has fascinated paleontologists and geologists, but the entire area was completely off limits because of the diamonds found there and the mines constructed by gulag prisoners under Stalin. However, a major investigatory expedition was undertaken in 1997, which greatly advanced understanding of the enigmatic structure. The impactor in this event has been identified as either an 8 km (5.0 mi) diameter chondrite asteroid, or a 5 km (3.1 mi) diameter stony asteroid. The shock pressures from the impact instantaneously transformed graphite in the ground into diamonds within a 13.6 km (8.5 mi) radius of the impact point. These diamonds are usually 0.5 to 2 mm in diameter, though a few exceptional specimens are 10 mm (0.39 in) in size. The diamonds not only inherited the tabular shape of the original graphite grains but they additionally preserved the original crystals’ delicate striations. 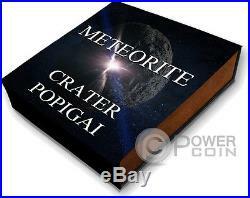 The item “METEORITE CRATER POPIGAI Meteor Silver Coin 1$ Niue Island 2016″ is in sale since Wednesday, December 16, 2015. This item is in the category “Coins & Paper Money\Coins\ World\Australia & Oceania\Other Oceania Coins”. The seller is “powercoin_italy” and is located in Roma. This item can be shipped worldwide.